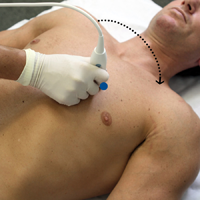 SONOSIM SUMMARY: This study from the Journal of Emergency Medicine attempts to correlate right ventricular strain diagnosed with Focused Cardiac Ultrasound (FOCUS) by performed ED physicians with pulmonary embolism and subsequent adverse in-patient outcomes. Results indicate that right ventricular strain diagnosed with FOCUS is a significant predictor of future adverse outcomes and that ED physicians of varying ultrasound skill levels may make this determination. In patients with pulmonary embolism (PE), right ventricular strain (RVS) on transthoracic echocardiography by Cardiology has been shown to be an independent predictor of 30-day adverse outcomes. However, it is not known how emergency practitioner-performed point-of-care focused cardiac ultrasound (FOCUS) with assessment for RVS compares with other prognostic methods in the Emergency Department (ED). To determine whether RVS on FOCUS is a significant predictor of in-hospital adverse outcomes when compared to other risk factors and scoring systems. Retrospective chart review of patients who were diagnosed with PE and had a FOCUS examination during January 1, 2007 through January 1, 2011 in an urban, academic center with a well-developed ultrasound program. Adverse outcomes were defined as shock, respiratory failure requiring intubation, death, recurrent venous thromboembolism, transition to higher level of care, or major bleeding during hospital admission. Statistical analysis included univariate and multivariate analysis to assess for prognostic significance. One hundred sixty-one patients were included in the final analysis. A total of 25 (16%) patients had an adverse outcome during hospitalization. On univariate analysis, only the presence of altered mental status conferred a higher positive likelihood ratio (6.4 vs. 4.0) than RVS, whereas absence of RVS had the lowest negative likelihood ratio (0.45). On multivariate analysis, RVS and cardiopulmonary disease were the only predictors of adverse outcomes that achieved statistical significance, with odds ratio of 9.2 and 3.4, respectively. In this retrospective chart review, a FOCUS examination for RVS performed by emergency care practitioners of varying experience level was a significant predictor of in-hospital adverse outcomes among patients diagnosed with PE in the ED. Future research should be directed at exploring ways to incorporate RVS assessment into ED prognostic models for pulmonary embolism.